The Stressless Peace (L) is perfect for individuals of larger size and stature. The ottoman completes the package for full body support or add on our LegComfort™ system — which hides a relaxing footrest under the seat until you’re ready to use it. The Stressless Peace (L) is the perfect relaxing recliner for any home. You’ll love the modern, comfortable design built with high-quality materials direct from Norway. The meticulous design of the Plus and Glide systems create the ultimate comfort experience for your back and neck. 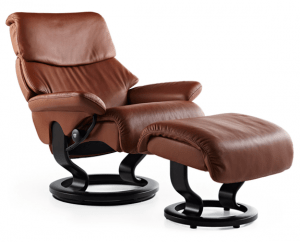 When you choose Ekornes, you’re guaranteed to receive innovative furniture designed with your long-term health and well-being in mind. We ship to any address in all 50 United States. Ask for details regarding shipments to Canada. For quality assurance, all Peace (L) shipments must be insured for accident, loss, or damage. Once your shipment leaves our facility, a tracking number is provided via email. Unless otherwise stated, delivery means “to your door”. Shipments must be signed for by someone over 18 years of age.